I Can’t quite figure this out but I typed out an entire post hit submit and then it posted a blank blog. GRRR. Ok so I gotta try and remember what I wrote. I’ve been DMing a homebrew 3.5 game set in Eberron for a while now. That’s actually where I got introduced to DDO. The players recently, about two months ago. Re rolled new characters and We started our new adventure. I started them off in Karrnath, where they encountered a demon cult, mostly members from Cult of the Dragon below and some Emerald Claw members. They had vanquished one of the cult leaders and prevented him from opening a portal to Kyber and releasing Hell spawn upon all of Khorvaire. The then tracked down another Head hancho of the cult Named Paldamer, He evaded them while teleporting them to Stormreach. Now Their next adventure awaits them. I have been working on this portion of the campaign and it’s what I want to end it with. They must travel to a newly discovered island west of Stormreach and help Colonize it. There is a number of giantish creatures there and fey that inhabit the Island. I want to make this rich and fulfilling. Giving them the opportunity to make alliances and form they own kingdoms. Here is the Party: I run with 6 to 7 players depending on who can make it on game night. 1. The Dwarf Rogue/Dwarven Defender – He is kind of the tank of the group, not that there really is a tank in 3.5 ED but he likes to think he controls the battle field even though the rest of the part can move faster than him. 2. The Half Drow Monk/Paladin – this guy is funny. He always gives these very descriptive instructions on how he is breakdance fighting during almost every encounter. Or he is attempting to grapple every creature. He also has a thing for throwing holy water on everything and punching inanimate objects. 3. The Evil Human Fighter – This one is the trouble. I will never again allow anyone to play evil alignment. It is horrible. She is greedy and steals all the treasure. So I added a few nasty curses on some things she took and it still hasn’t slowed her down. 4. The Pixie Fire Mage – Another mistake I made is allowing monster races. This thing destoys just about everything I throw at the party. Absolutly rediculous. 5. Half Ogre psionic warrior – psionic warriors are one of the dumbest things Wizard of the Coast added to this game. They have so many ways to effectively ruin the balance of a game. No more Psionics! 7. Goliath Fighter – There is a trend here, a lot of fighters. Probably one of the most underwhelming classes in D&D. This one is not to big of a deal Hits hard with a two hander but again nothing you cant work around. Anyway I have been working extremely hard to make up for the huge balance flaws in my current game. Magic items have been exteremly hard to come by expecially ones useful to the players that are already overpowered. And Monsters tend to have Higher AC and Higher HD than they should. This is to make combat last longer than a round or two and to make the boss fights feel challenging. With some art found while googling and photoshop I made a map. One thing to note is We play at a table around a TV. This TV displays our map and has other visual and audio aids. So everything is digital. 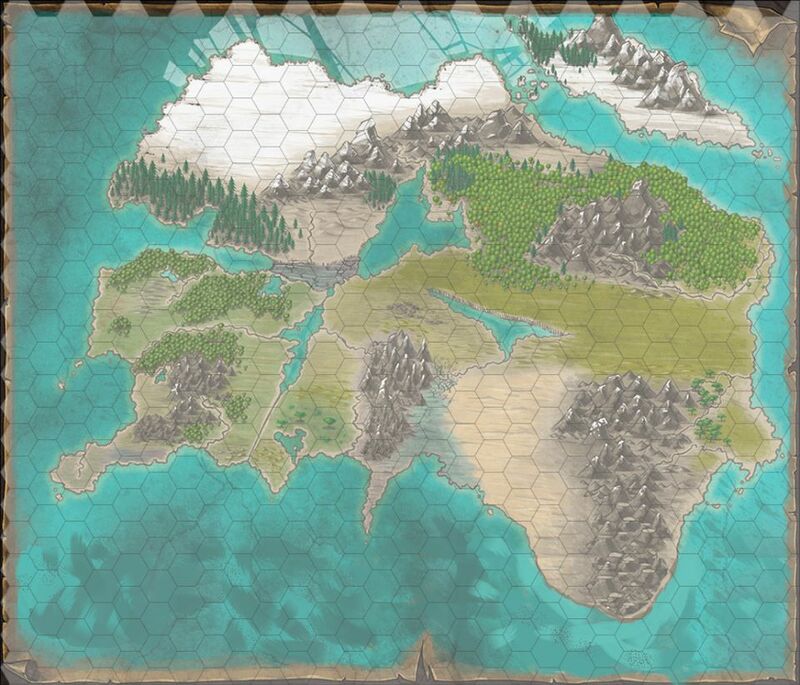 It has been extremely fun creating and populating a new world. I also will note, and the players don’t know this yet they are not the only ones trying to claim this new land. Paldamer and some other factions will be found on this island. Maybe even some of Kybers less desirables. Thanks for reading and Happy Questing! Next Post My D&D 3.5 Homebrew Pug Race.